A bed of snowflakes and coordinating ornaments in thread will add just the right wintry touch to your holiday decor. 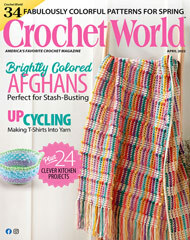 This e-pattern was originally published in the December 2009 issue of Crochet World magazine. Size: Afghan: 52" x 68". Ornament: 2 1/2" diameter. Made with medium (worsted) weight yarn, size 10 crochet cotton thread, size I (5.5mm) hook and size 4 (2mm) steel crochet hook.